Nose: Boot leather, sea water, crayons. Sweet malt, with a slight whiff of sulphur. Palate: Boiled sweets, vanilla, apricot, acidic peat, lemon, and iodine. Finish: Salt and pepper, and slightly drying mouthfeel of stewed tea leaves. Quite a simple, but tasty dram. Sweet and peat, at a good cask strength. 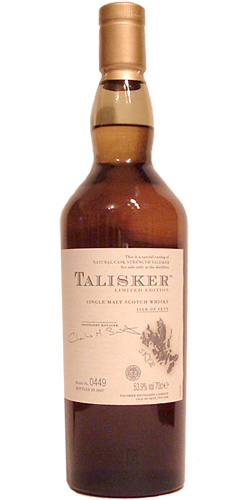 It’s more interesting than standard Talisker but I don’t think I’d buy a bottle at the distillery for £90. There’s nothing outrageous going on with the flavour, but it’s a solid whisky. If someone was offering, I wouldn’t turn down a second measure. Samples available on WhiskySample.nl for €14.50.